The music business is filled with inflated egos and individuals craving adulation. So when you come across an artist that is the complete opposite of that, it's quite a relief. The gentlemen of Good Old War are just that, sincere songwriters that are quite humble about the craft that they have undertaken. 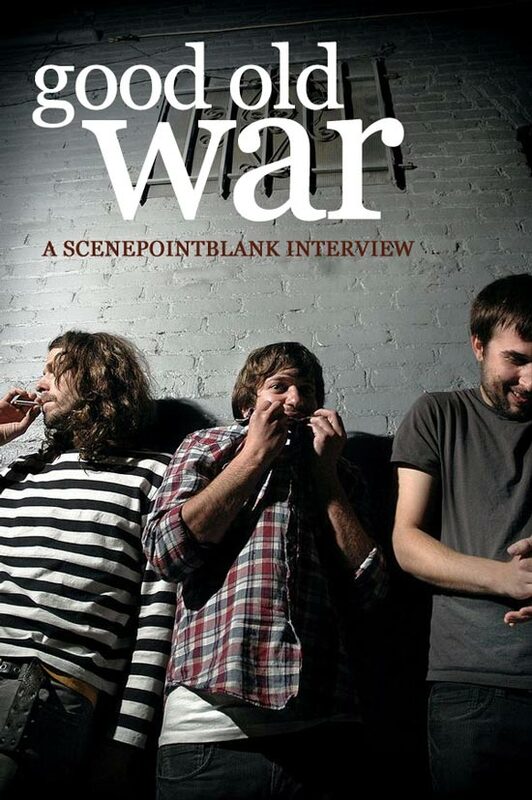 Scene Point Blank spoke up with guitarist/vocalist Dan Schwartz about the band's recent touring activities, their unique writing process, and the essence of being a musician. Scene Point Blank: Introduce yourself? Dan Schwartz: My name is Dan and I am the guitar player and am harmony singer in Good Old War. Scene Point Blank: A year ago was your first tour together, what major differences do you notice between then and the tour you're part of now? Dan Schwartz: The only difference is that more people know our songs now?but we still have just as much to prove. I think the main difference is our confidence. And you get more confidence seeing people out there signing along with you, knowing they have your record. It's really surprising how fast things have grown for us. Scene Point Blank: A lot of the tourdates are sold out. That's go to be pretty exciting to be a part of. Dan Schwartz: It's awesome. Both of our big tours have been like that. And that's largely due to the bands giving us the opportunity - more than ninety percent. We're really just an upstart band so we give them full credit. They're giving us the opportunity to play in front of their fans. Scene Point Blank: Yeah, I first heard you guys a couple months ago. The response tonight was pretty cool to see for a new band. Dan Schwartz: We've been so lucky. Sometimes you get it together and it works and that's great? because most of the time it doesn't. And we've been doing this for so long with different bands, to have anyone knowing or caring, it means so much to us. Scene Point Blank: How has the crowd reaction been to you on this current tour, given The Gaslight Anthem's fan base is a bit more punk than what you're probably used to? Dan Schwartz: Honestly, we've done one, maybe two headlining shows in our entire time together. We're about to start doing headlining shows next week. But, the reaction has been mostly positive. There are always a handful of people that aren't going to like you, but you're not going to please everybody. I think the cool thing is that we've been able to be shared by families. Parents will bring their kids, and kids bring their parents. And that's the coolest. The major thing that we're attempting to do is that crossover thing. If we can get as many people as possible to listen - and we're not trying to sell out - we but are trying to be as listenable as possible. Scene Point Blank: You see a lot of that with a lot of bands - Murder by Death is one that comes to mind. A lot people that are into that classic rock, country and folk style will be into it, but also there is the younger crowd. Dan Schwartz: That's the cool thing about playing with The Gaslight Anthem is that they already have that kind of a crowd. They're working from a model that we kind of want to emulate in a lot of ways. They have that respect. And they've earned it and they deserve. And at the same time, the kids still like it. And the cool guys can say, "That band is awesome." And the kids can agree and it's not embarrassing to anybody. And that's a huge goal for us, one that would be amazing to have for any band. Posted April 14, 2010, 12:16 p.m.
Posted March 11, 2010, 10:37 p.m.
Indie rock trio Good Old War will release their sophomore album, Good Old War, on June 1st via Sargent House Records. Posted Nov. 4, 2009, 2:32 a.m.